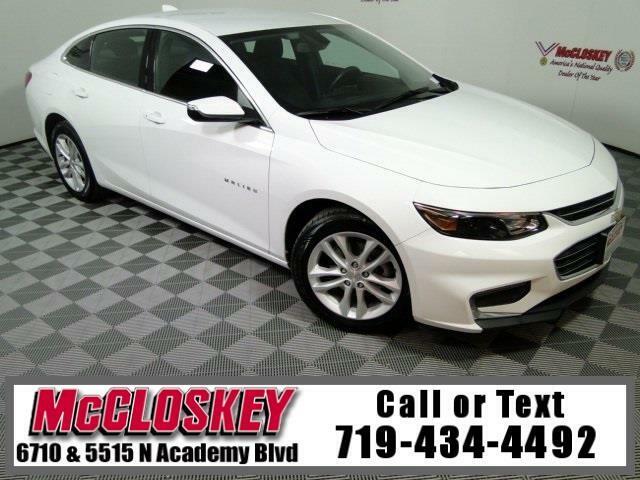 Ride in style in this 2018 Chevrolet Malibu LT with Keyless Entry, Remote Start, Navigation System, On Star Connectivity, Premium Sound System, and Backup Camera. Upgrading to the 1LT trim gets you all of the LS' features, as well as 17-inch wheels, heated mirrors, an eight-way power-adjustable driver seat, rear-seat air vents and satellite radio. The L, LS, and 1LT are all powered by a turbocharged 1.5-liter four-cylinder engine (160 hp and 184 pound-feet of torque) mated to a six-speed automatic transmission. The current Chevrolet Malibu is a bold step forward for this previously disappointing family sedan. Its long-distance comfort and capable performance are what you expect for the segment, while its sharp handling make it a standout! This vehicle passed our 110 multi-point inspection and is backed by our National Quality Dealer of the Year Award. We are an ''A+'' Better Business Bureau Rated Business. We offer low interest rate financing, low down payments and the highest trade allowances in the state! Here at McCloskey we do things a bit differently, we shop our competition every day to ensure a great value to you. Come on down and experience it for yourself. This McCloskey Assured vehicle includes a 2 month/2000 mile Warranty and a Vehicle History Report!! At McCloskey we strive to provide ASSURANCE, TRUST, VALUE AND QUALITY! Call 719-434-4492.